Each year, the St. Paul Fire Department in Minnesota conducts more than 1,000 presentations, events and programs, reaching nearly 100,000 people with safety information. But they know that numbers alone don’t tell the whole story. That’s why the department closely tracks not just its reach, but most importantly, its outcome. Paula Peterson, public education officer for the department, shared the findings, which underscored the importance of demonstrating the documented link between prevention activities and reduced fires, injuries and deaths. St. Paul carries out numerous fire safety efforts, individually and in partnership with other groups. To illustrate the importance of testimonials and documentation, take a look at two examples from the fire department, which work in tandem. The first is the “Follow the Footsteps to Fire Safety” program which emphasizes preventing fire play among young children. It costs approximately $30 per classroom for materials the first year, and approximately $3,150 in fire department staff time per year. The second is the “Fire Play Intervention Program,” which is family focused and intervenes on fire-setting behavior. Material cost for the intervention program is under $5 per child with staff costs roughly $1,000 per year. Families enrolled in this program have the option of participating in a variety of other fire department programs such as “Project Safe Haven,” a home inspection and smoke alarm installation program which is grant funded. 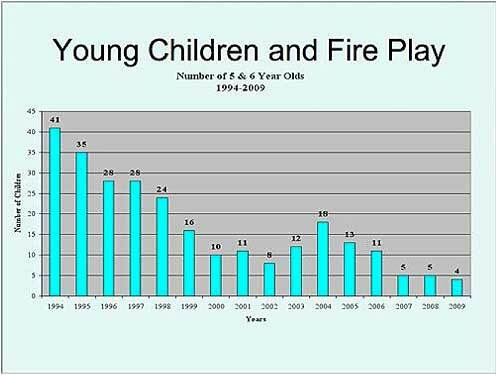 Peterson says that “Follow the Footsteps to Fire Safety” and “Fire Play Intervention Program” combined have led to an 85 percent reduction in child fire play over the past 15 years. Additionally, by presenting a combined approach, the number of children seen for fire play problems has dropped from more than 200 per year to an average of 30 per year. As a stand-alone program, “Project Safe Haven” has reached more than 500 households in just over two years. To date no fires, fire deaths, fire injuries or line of duty injuries or deaths have occurred in any Safe Haven home. “The bottom line is that public education gets results and is a cost-effective way to prevent fire, fire deaths and line of duty deaths among firefighters,” Peterson says. Read through the St. Paul Fire Department’s PowerPoint presentation to see how outreach and results are documented. The St. Paul case study is a model for documenting the role and importance of fire department prevention activities and programs. Demonstrating successful outcomes can be communicated in a variety of ways. Read the success stories posted by grantees of the Assistance to Firefighters Grant Program.